This functionality is available only in the PRO edition. The library provides the ext/dhtmlxgantt_auto_scheduling.js extension that gives Gantt the ability to schedule tasks automatically depending on relations between them. For example, imagine that you have two tasks connected by a dependency link and the second task starts when the first one ends, and you need to change the schedule of the first task by moving it to a new date. Auto scheduling makes the start date of the second task update according to the end date of the first task each time when it changes. This feature allows you to generate and maintain project schedule by specifying relations between tasks with no need to set dates of each task manually. Lag and lead times are special values that are used to create complex relations between tasks. Lag is a delay between tasks which are linked by a dependency. Lead is an overlap between tasks which are linked by a dependency. E.g. : If we set a lag equal to 1 day for the dependency link, task B will start in one day after task A ends. lead - a negative value of the lag. By default, it's implied that the lag value of each dependency link is set as 0. Gantt doesn't provide a built-in UI for editing lag or any other properties of the link. However, you can implement it manually by following the recommendations given in the related chapter. dhtmlxGantt provides the possibility to set additional time constraints for tasks. Time constraints are applicable only to tasks and milestones. Projects are not affected by them. You can specify constraints for a task via the Constraint control in the lightbox of a task. 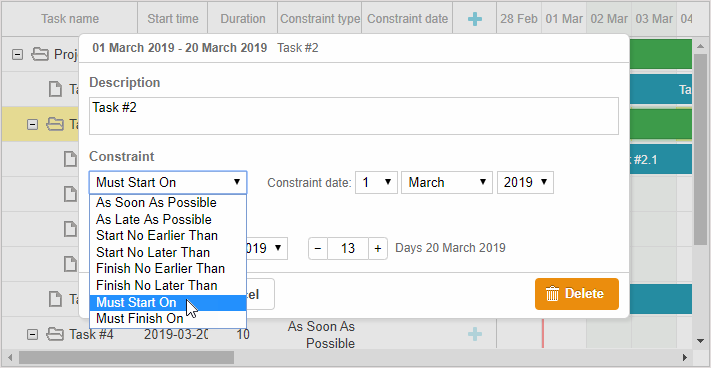 It is also possible to specify separate columns for the type of constraint and its date in the grid and use inline editors to define constraints for tasks. Use the constraint_type and constraint_date columns' names, correspondingly. 1. As soon as possible - If this constraint is set to an independent task, the task starts at the same time that the project does. If this constraint is set to a dependent task, the task starts as soon as its predecessor tasks end. 2. As late as possible - If this constraint is set to an independent task, the task ends at the same time that the project does. If this constraint is set to a dependent task, the end of the task coincides with the start of its immediate successor task. 3. Start no earlier than – the task should start on the specified date or after it. 4. Start no later than – the task should start on the specified date or before it. 5. Finish no earlier than – the task should end on the specified date or after it. 6. Finish no later than – the task should end on the specified date or before it. 7. Must start on – the task should start exactly on the specified date. 8. Must finish on – the task should end exactly on the specified date. The forward planning of tasks is used by default, i.e. gantt.config.schedule_from_end is set to false. In this case planning of tasks is implemented from the start date or from the date of the earliest task. Tasks are planned as soon as possible, if there are no other constraints applied to them. In this case tasks are planned as late as possible. The last task should end on the end date of the project. When a user changes the date of a task by moving it with the mouse pointer or via the lightbox, the task automatically receives one of the two constraint types: either start no earlier than+%start date% or finish no later than+%end date%, depending on the chosen planning strategy. Thus a task won't be scheduled to the earliest date if the later date is set from the UI. This may be confusing to a not prepared user especially since constraints are not displayed in the chart by default. You can enable constraint display using the addTaskLayer method. This behavior differs from the auto scheduling logic of gantt prior to v6.1 and is considered to be correct, since it's the same way auto planning works in MS Project.